Parts wanted - Oakland Owners Club International, Inc. Wanted: Luggage rack with hardware for 1929 Oakland Sport Roadster. Mark Paupore,N355 Homestead Rd.,Vulcan, Michigan 49892 (906)-563-9973. Petrol Tap - We need an autovac brass fuel tap for our Oakland 34B. It is a 3/8 UNF female fitting at both ends. 1931 V8 Dash Knobs - DASH KNOBS (choke, lights, throttle) for a 1931 V8 Sedan. 1931 Sedan rear seat cushion. Rear bottom seat cushion for a 1931 Oakland 4 door sedan. Any condition. 1918, 19 or a 34B. Budd 24″ 32 X 4 SS wire wheel 60 spoke lock rings. Rear drive hubs or sample for dimensions. Budd Oakland hub tags. Klaxon horn, fire wall mounted reverse trumpet with smaller outlet. 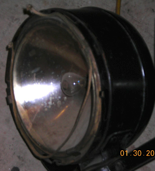 1924 Headlight rim 9” diameter x 1 1/4” deep. Also need a windscreen wing bolt. 1916 – 31 Oakland carburetors , condition not important. 1928 Sedan Ignition switch, fuel gauge, four(4) good hubcaps, headlamp, light switch. 1912 Model 40 Touring - Complete Hood. 1928 Oakland - Two complete wooden wheels (12 spoke) with rim for restoration. Hubcaps if possible (no tires needed). Circular Radiator emblem for ’28 Oakland. Any ’28 era Oakland emblem. 1929 OAKLAND - Three or four hubcaps to fit EARLY ’29. Approx. 3.25” thread. Interior door handles /window winder. Two Gas/Radiator caps. (Flat).